The rapid growth of green building means that new home owners can take advantage of the lower operating and maintenance costs that come with these energy- and resource-efficient homes. But for the 120 million existing homes in the United States, remodeling is the only way for home owners to incorporate green practices. NAHB Remodelers offers the following suggestions to home owners who want to increase their home’s efficiency, decrease costs and take advantage of the other benefits that green offers. 1. Install maximum insulation in the area to be remodeled. Forty percent of the energy consumed in a typical house goes to heating and cooling. Adding insulation is an easy way to increase efficiency. Insulation is rated by its ability to resist heat flow, commonly known as “R-value.” The higher the R-value, the better its ability to resist heat flow. Adding insulation will help save energy costs, increase comfort by better controlling temperature and improve indoor air quality by eliminating many gaps through which dirt, dust, and other impurities can enter. 2. 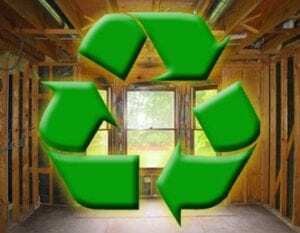 Install high-efficiency windows instead of those that just meet the energy code. Ordinary window glass transmits ultraviolet heat rays from the sun, which can increase your air conditioning bill dramatically. ENERGY STAR windows can help control this effect. These windows may have two or more panes of glass, warm-edge spacers between the panes, improved framing materials and microscopically thin metal or metallic oxide layers deposited on windows to reduce radiative heat flow. 3. Seal all exterior penetrations in the area being remodeled. 4. Purchase only ENERGY STAR-rated appliances. ENERGY STAR-rated appliances, ranging from dishwashers and refrigerators to computers and televisions, meet strict energy efficiency guidelines set by the U.S. Environmental Protection Agency and the U.S. Department of Energy. Qualified refrigerators, dishwashers and vent fans incorporate advanced technologies that use 10-50 percent less energy and water than standard models, more than making up for the slightly higher costs of these products. 5. Install low-flow water plumbing fixtures. 6. Upgrade to an ENERGY STAR-rated or tankless water heater. Tankless water heaters provide hot water on demand at a preset temperature rather than storing it. Replacing an electric water heater with a solar model can reduce costs by up to 80 percent a year. Over its 20-year lifespan a solar heater will prevent more than 50 tons of carbon dioxide emissions. A low-cost option is to wrap insulation around your heater, which can reduce standby heat losses by 25 to 45 percent. 7. Purchase the highest efficiency HVAC system you can afford. Over a 10-year period, the average home owner spends more than $10,000 for heating and cooling. Installing high efficiency ENERGY STAR HVAC equipment can reduce utility costs on average by 10 to 30 percent over minimum efficiency equipment. It also can improve home comfort with more heating and cooling and a quieter operation, and often features higher quality components that result in longer equipment life.